November is half over and you're thinking "Wait! Where did Ava go?" 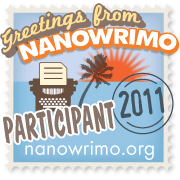 Well, I've been absorbed in a little thing called NaNoWriMo (National Novel Writer's Month). It's where you write a 50,000-word novel in 30 days, beginning Halloween night at midnight and ending at 11:59 PM on November 30th. Unfortunately my crafting is taking a back seat. BUT the month is half over and I've surpassed the halfway mark of 25,000 words! Yay. Now I just need to add straps to all of the armor so I can actually wear it while moving. Heh. Then I can wear it to PAX Prime 2012! i so wish i could do this. i'm to shy i guess.